If you are looking for a file server backup software for your Windows file Server, you may want to check out BackupChain. 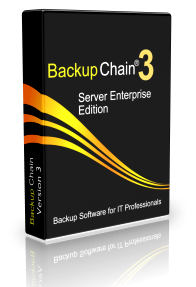 BackupChain offers dozens of features specifically for file backup, such as version backup and filtering, but also includes disk imaging capabilities. Whether you are backing up a NAS or plan to set up a network backup or cloud backup, it can be all done using one and the same tool. Configurable retention limits: you would want to keep X versions of each file, depending on its type. A typical file server may host databases, Excel sheets, Word documents, etc. While it is often possible to hold on to each Word document indefinitely due to their small size, larger databases can’t be backed up forever. A good solution allows you to configure retention by limiting the ‘number of versions’ to keep and also allowing you to stipulate time limits after which certain files expire and are automatically deleted. Can the backup tool receive backups from other sites or servers? Is the tool capable of deduplicating large files over FTP for remote backups? Are affordable cloud backup plans available for large file servers? Does the tool handle Unicode (foreign and special) characters and extremely long path names properly? BackupChain meets all the criteria stated above and much more. In addition to file server backup, BackupChain also offers full system backup and HDD cloning. Download the full version today!